The PR2 Suzuki Linkage system was developed within the Team Suzuki 85cc Racing Program. Used to win countless 85cc and Supermini National Championships, Team Suzuki Factory Mini riders (Ken Roczen used our linkage when he came to the US to compete in Amateur National events) and many others have demanded it’s performance. Our design still remains the winningest linkage system on the market today with its results proven design. Designed to correct the initial harshness and mid-stroke “spike” associated with the stock linkage system. 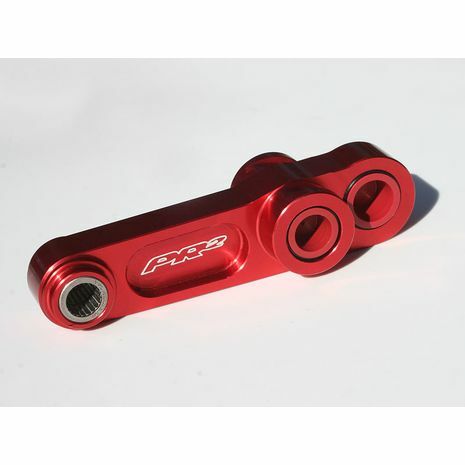 The PR2 linkage changes the leverage ratio to handle small, choppy acceleration and braking bumps while keeping the rear wheel on the track for maximum traction and control. The overly progressive stock linkage ratio curve is retuned to absorb the deflections experienced from large braking bumps and aggressive acceleration. The uncontrollable deflections in rear of the bike will be greatly reduced or eliminated. The rear suspension will smoothly stroke through and absorb these hard hits. An absolute must for the RM85 Racer! !